BCN, 16 Jan 2019.- The body’s cells are constantly changing. But which of these changes are healthy developments and which lead to serious diseases? This is what LifeTime, a transnational and interdisciplinary initiative of leading European researchers, wants to figure out. The consortium, which includes researchers at the Centro Nacional de Análisis Genómico (CNAG-CRG) of the Centre for Genomic Regulation (CRG) in Barcelona, is jointly coordinated by the Max Delbrück Center in Berlin and the Institut Curie in Paris. It has now cleared an important hurdle: LifeTime will receive one million euros to devise a plan how to embed its vision into the European research and innovation landscape. How can signs of disease be detected as early as possible at the cellular level so as to quickly prevent disease progression through appropriate treatment? The European Union is now investing a million euros over a one-year period in devising the plan for a fundamentally new approach to understanding the constant changes within cells and their relationships to one another, thus creating the foundation for the precision medicine of the future. The funds will go to the international LifeTime consortium, which is jointly coordinated by the Max Delbrück Center for Molecular Medicine (MDC) and the Institut Curie. Two researchers at the Centro Nacional de Análisis Genómico (CNAG-CRG) of the Centre for Genomic Regulation (CRG) are involved in the project: Marc Marti-Renom, ICREA research professor, leader of the Structural Genomics group and co-chair of the Computational Biology workpackage of the LifeTime initiative and Holger Heyn, who has recently joined the consortium and leads the Single-Cell Genomics team at CNAG-CRG. More than 120 scientists at 53 institutions in 18 European countries are supporting the LifeTime consortium, as are more than 60 partners from industry. The European Union will concurrently fund the preparation of five other potential research initiatives. After the first year of funding, it will be up to the European Union to decide if any of them will be continued as a large-scale research initiative. If a 58-year-old woman is diagnosed with a heart attack, there is currently only one option. Physicians will use a cardiac catheter to look for obstructed or narrowed blood vessels and then treat her according to textbook protocols. The procedure might look different in the future: Physicians first take a tiny sample at the site of the heart attack. They then sequence the RNA which is expressed there by the DNA in individual cells, thereby identifying the cell aggregates that have become inflamed and that can either heal the aftereffects of the heart attack or cause additional damage. What is crucial here is the development of innovative technologies that enable scientists to not only analyze cell populations, but also study individual cells in detail. Data gathered this way can be used by physicians to design precise therapeutic strategies. This vision of precision medicine cannot be realized by only gathering human behavioral data from smartphones and wearable microcomputers – so-called wearables. Instead, it requires an understanding of how individual cells in the body change over time. That is because cells are not static components, but rather dynamic units that undergo constant transformation. They develop and multiply, form tissues with numerous other cells, acquire new characteristics, or simply age. Such change can be a normal development or lay the foundation for disease. Cells are especially prone to change over the course of the disease process. LifeTime’s research teams combine cutting-edge technologies within the project and thus significantly push forward their development in Europe. 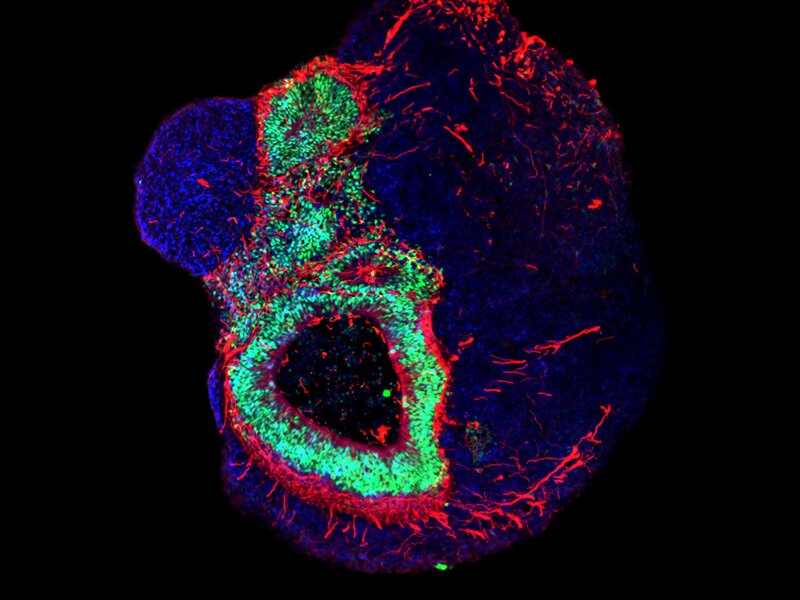 For example, miniature organs grown in the petri dish – so-called organoids – and other innovative system such as new single-cell biology techniques play a crucial role here. The organoids derived from patients’ stem cells enable the development of personalized disease models. Combined with the genome editing tool CRISPR-Cas, drugs as well as state-of-the-art microscopy, and other models they will help scientists understand how cells stay healthy or progress towards disease and react to therapeutics. The experiments – performed using high-throughput methods – generate huge amounts of data. Machine learning and artificial intelligence are therefore required for the analysis. The computational strategies identify patterns in the transformation of cells and can, for example, predict the onset of a disease or how a disease will progress. Together with mathematical models that enable the reconstruction of the cells’ past development, it is thus possible to infer how healthy cells become unhealthy cells. The scientists are also searching for central controls that can reverse or even completely prevent disease-causing changes. The proposed groundbreaking initiative brings together not only researchers from the fields of biology, physics, computer science, mathematics, and medicine, but also experts from disciplines such as sociology, ethics, and economics. A public consultation will be undertaken to engage citizens and identify their concerns early in the project. It is anticipated that the LifeTime initiative will significantly impact the pharma, biotech, and data processing industries, as well as other sectors, while also positively influencing Europe’s competitiveness. The proposed transnational initiative is supported by more than 60 companies and by major European research organizations such as the Helmholtz Association in Germany, the National Centre for Scientific Research (CNRS) in France, the Wellcome Trust in the United Kingdom, the Netherlands Organisation for Scientific Research (NWO), and the EU-LIFE Alliance, as well as by national science academies. “LifeTime is an outstanding project of European pioneers. This interdisciplinary and international cooperation has the potential to raise health research, and thus medical care to a new level. Therefore, we are very pleased that the EU is financing the LifeTime consortium. LifeTime is in the best sense: research for people," says Otmar D. Wiestler, President of the Helmholtz Association. The consortium will be receiving EU funding for one year to prepare a detailed plan for a ten-year research initiative. “This is a huge opportunity,” says Professor Nikolaus Rajewsky, who heads the MDC’s Berlin Institute for Medical Systems Biology (BIMSB), a hot spot for single-cell analyses. He is one of the two coordinators of the research consortium. “All of LifeTime’s members are among the best in their respective fields. They are doing visionary work. We are going to use this year to intensify our collaboration, share our vision and extend our network within Europe and beyond.” A launch conference will be held in Berlin from May 6 to 7, 2019, where the consortium’s members will introduce the initiative and provide information on how LifeTime plans to strengthen life sciences and healthcare in Europe. “LifeTime will bring genomics closer to the day-to-day clinics” says Marc A. Marti-Renom, group leader of the Structural Genomics laboratory at CNAG-CRG in Spain and co-chair of the Computational Biology workpackage of the initiative. “This can only be done with the concerted effort at European level of researchers covering almost all science and technology disciplines. We have now a year to show we can work together”.